I don't know about you, but I get totally excited when I hear about something new in the cake community. And a sweet bit of news recently came my way via Leanne, whose delicious cakes I have sampled and who has purchased my artwork--she's part of a new cake publication, Cake Central, which will be publishing their first issue in March of 2010! Cake Makers, Foodies, and Cake Enthusiasts alike have been waiting for a first-class cake decorating magazine and that wait is over. 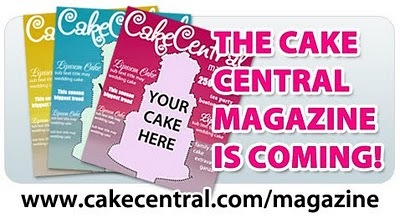 Cake Central’s Glossy Printed Magazine is coming in March and currently taking subscription orders. The cost of the (monthly) magazine is only $60/year with FREE shipping within the USA. and the professional cake decorator. This premium publication is ideal for anyone who bakes, makes cakes, aspires to make cakes, watches cake decorating shows, or has an interest in beautiful food! I can't wait too see what they come up with! For more information or to subscribe, visit the Cake Central website.